We would like to welcome you to the sport of BMX. BMX is Bicycle Motocross. BMX is a sport for all ages. Some riders start as young as 3 years old and go up to 60 + years old. BMX is a family sport. There are no coaches in BMX. Mom and Dad are the coach, pit crew, cheering section and are there to shake your hand when you win and dry your tears when you lose. Riders of the same age and skill level race their 20" bicycle or cruisers 24" over the track of turns and obstacles. If you like riding your bike around the neighborhood or on a homemade track or jumps, you'll love this competitive type of racing on a local, state, national and international level. This type of racing is much safer than riding on the street. YOU have to wear protective gear and your bike must pass safety inspection. Sanctioning bodies give BMX racing it's organization. They set the rules, provide insurance, issue competition licenses, and keep record of points to determine state and national rankings. The NBL is proud to offer a comprehensive BMX program that recognizes the value of local competition. At every level our programs focus on the individual rider, providing a chance for growth and development while having fun. Points help to determine a rider's status in his or her state/track. Under the LEAP program, the NBL will award number plates to the top 10 riders in each proficiency at each track. Points aren't anything to really worry about when you are just starting out. For that matter, they don't even really need to be considered important. You can race whenever you want and however many times you want, just for the fun of it. 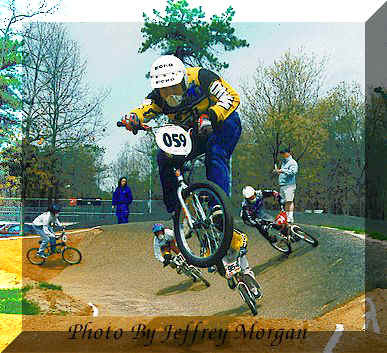 The NJ BMX Association runs a state program. This program determines your state rankings and is a qualifier to participate in the President's Cup Race in Ohio each year. If you are interested in finding out more about racing on the state level, Please pick up a flyer at registration. Read the information carefully and be sure to ask for help on anything you do not understand. Everybody finds it confusing at first, just don't wait until it's too late to qualify. The NBL offers a great starter program for all new riders. A 30-day (trial period) at a cost of $30.00 will allow new riders to practice, race and receive points. After 30 days, they must become full members to be permitted to continue to race or practice. After paying an additional $15.00 (for a total of $45.00), the membership will be valid for one year from the date of the trial membership application. When paying the conversion fee of $15.00, you must bring a copy of your birth certificate because it will not be returned to you. A full membership entitles a rider to race at any NBL sanctioned track in the USA and Canada ..
3. Your own NBL membership card. 1. No one except licensed riders officially entered in the race may ride or practice on any portion of the track. 2. Each rider must be ready when his class or moto number is called. Note: Each rider should be in staging at least 10 motos early. 3. When a rider does not show for his moto the first time, he/she will be scored with a "CR" which stands for credit and is comparable to last place in the moto plus two (2) points. A "CR" applies to transfers only. Any rider not starting more than one race will not be eligible to transfer. Also, a rider's position may not be filled by another rider to ride as his/her representative. 4 The race referee is the final authority at any event. 5. The race referee has the right to exclude any participant from the meet if it is in the best interest and safety to the other participants or the spectators. There will be no poor sportsmanship, foul language, drugs or alcohol allowed on or around the track. 6. A rider may push their bike across the finish line. 7. Any rider who did not complete a moto will receive points corresponding to the total number of riders entered in his moto. A rider must have started the moto in order to receive a "Did Not Finish" (DNF). 8. Any rider leaving the course must re-enter at the nearest safe point, but in reentering the course, he may not cut the course so as to improve his position or interfere with another rider. 9. Gate positions for the first three motos are on the moto sheets. Gate positions for the semis and mains will be drawn by cards in the staging area. If the race is done on the computer, the gate position for the semis and mains will also be on the moto sheets. 10. It is the riders responsibility to be on the gate when his moto is ready to be raced and in his assigned or drawn gate position. 11. Neither rider nor parents are permitted to talk to the score keepers. Protests involving contact with another rider on the course must be communicated orally to a race official at the finish line immediately following the conclusion of the race in which the contact is asserted to have taken place. A rider wishing to file such a protest must raise his hand and remain in the designated area at the finish line until he is recognized by the appropriate official. If a rider leaves the finish line area, his protest will not be handled. 2. Wheels or dissimilar size cannot be used on the same bike. 3. A girls or boys bicycle may be used. 4. Handlebars must have grips and end caps in good repair. 5. Motocross handlebars are not to exceed 28 1/2" including grips. 6. Pads must be on cross bars, frame bar and goose neck. 7. Frame and handlebars must be firm, not cracked, loose or damaged. 8. Seats must be firmly attached. 9. Pedals must be or rubber or metal and not broken. 10. Spokes must be tight and none should be missing. 11. Tires must be in good repair, not bald. 12. Kick stands, reflectors and chain guards must be removed. 13. Axles protruding more than 1/4" beyond nuts must be cut off or covered. 14. All sharp ends must be covered. 15. Bikes must have an operable braking device. Front brakes must be disconnected. 16. Helmets must have permanent chin strap, either full face or with mouth guard. 17. Shirts must be long sleeved. 18. Shirts must be tucked into pants. 19. Pants should be of heavy material. 20. No wallets w/chains will be allowed. 21. No hats will be hanging from you handle bars. 22. all bikes must pass safety inspection before going on the track. There are several brands of bikes with too many minor differences to go into detail but most important is getting the correct size bike. TIPS: With both feet flat on the floor, you should have a minimum of two inches of clearance between the top tube and the inseam of your pants. If you don't, look into a smaller model. Sit on the Seat: With the seat-post raised 6 to 8 inches, sit on the seat and put you foot on the pedal (with the pedal at the lowest position). Your knee should have only a slight bend to it. Hands on the Grips: Sit on the seat and put your hands on the grips. The handlebars should be tilted back a bit from vertical. Your elbows should have only a slight bend to them. Your hands should not be more than a hand's width outside of your shoulders. Understand sizing a bike should be determined by knowing the rider and the options. No two riders are exactly alike and as a riders grows there needs change. This guide is only to be used as a reference not something you must follow to the letter. Don't ask only experience will answer the question.